I love boots. In fact, if you ask my husband, he would say I am obsessed with them. Having so many pairs, most of which I don't even wear any more, I just hate to throw them out. I'm like Gollom, in that sense, I can't get rid of my precious belongings. So obviously, when Pavers got in touch asking if I wanted to review a pair of their boots, I said yes. 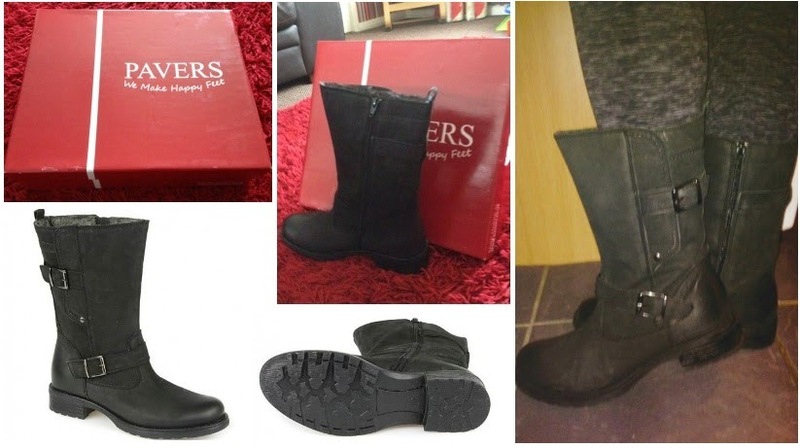 Pavers was founded by Cathy Paver as she could never find stylish shoes that would actually fit her and so, in 1971, York based Pavers Shoes was formed. Pavers Shoes has gone on from then to become one of the UK’s leading comfort footwear specialists having over 115 shops throughout the UK and Eire, catalogues and a website, to make finding the perfect pair of shoes a doddle. Along with their own brands, they also stock Skechers, Marco Tozzi, Rieker, Piccadilly and many more with comfort always being important and at the forefront of what they do. Pavers pride themselves on providing first-rate customer service, offering free delivery over £50 for buying online and you can even collect in store too to make the ordering process even easier. After having a look at the Pavers website, I fancied something a little different. I usually go for wedged boots or fluffy ones, but these gorgeous Nubuck Leather Calf Boots stood out to me and were calling my name. The Nubuck Leather Calf Boots are somewhat of a biker style boot with a small, 3cm heel on them. They have a double strap and buckle design and although are leather, they have quite a suede feeling to the top part and look really stylish to wear. The soft textile lining will be sure to keep my calf's cosy warm this winter also. I was apprehensive at picking these at first as the base and foot part looks quite hard and I was worried that they may be uncomfortable to wear for long periods of time. This couldn't be further from the truth though as the boots are incredibly comfortable, even on long walks with the boys I have found that they are soft and warm to wear. The boots are wide around the calf and so aren't tight at all, the cosy, fluffy insides keeping me legs warm also whilst that leather exterior makes them waterproof and protective. The small heel gives extra comfort which isn't too high at all and the super thick sole will be perfect for walking, and trying to keep upright, if the snow hits this winter. Personally, I love that they are wearable with most things after trying them on and being comfortable wearing them with my jeans, leggings (I am pregnant and so these are a staple item in my wardrobe) and even dresses. Yes, that's right, if I decide to go for the biker chick look, I can go a bit Gothic with biker boots, a gorgeous plum coloured maternity dress and black tights, truly stunning! Overall, at £64.99, I find the Nubuck Leather Calf Boots comfortable to wear, stunning and stylish to look at and all at an amazing price. I absolutely love these Nubuck leather calf boots and am so glad I picked them but you can also check out the whole range of women's ankle boots that Pavers sell too. I cannot believe that I am now three-quarters of the way through this pregnancy now. It only seems like yesterday that I found out that we were expecting again. Yes, there may have been many (many) hurdles in between, but now I can see the finish line and know that our baby will be here soon. My sickness is easing now but heartburn is still prominent and getting worse all the time. I feel as though I am just downing Gaviscon at the moment to stop it from burning. And of course, the pulled muscle in my back is still playing up, causing pain but I'm trying not to think about that too much. I have felt that baby hiccup loads recently. I think it may be down to the fact that I am drinking fizzy drinks and maybe it's passing on to him but I'm not quite sure whether that can happen, and to be honest, I still can only drink fizzy drinks so it will probably be like this till the end now. It's getting to the stage now where sleep is very disturbed. If I'm not waking to pee every hour, then the baby wakes me up having a play or heartburn flares up, so as you can imagine, it is quite hard at the moment to focus and get things done because I am constantly tired. 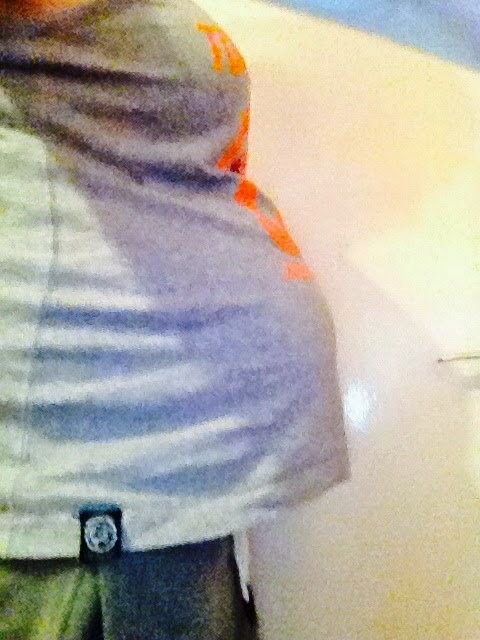 As for bump, should be weighing in at around 3 pounds and be nearly 16 inches long. He may be now piling in the fat, ready for entrance into the big wide world, but he is also losing the fine lanugo hair that covers his body. 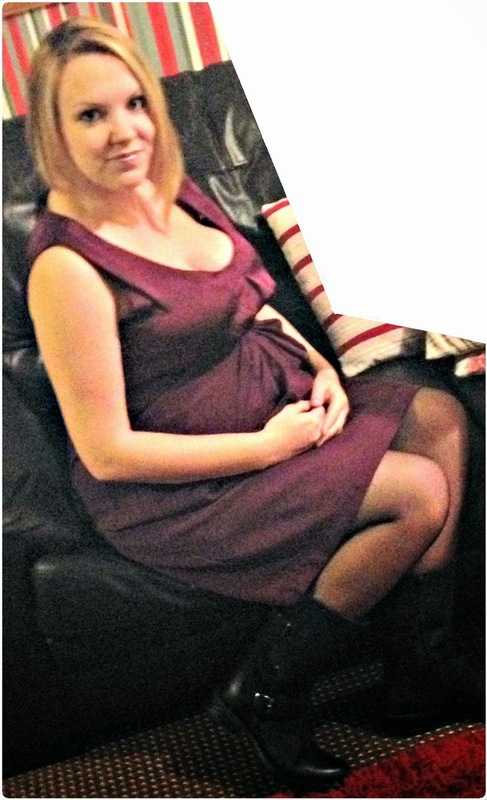 I don't see the midwife now until 34 weeks and so shouldn't really have much to update on between now and then. If I do though, you lot will be the first to know. My baby now weighs around 2 1/2 pounds and is just over 15 inches long from his head to heel. At this stage his head is growing bigger to make room for his developing brain and to meet his increasing nutritional demands, mums-to-be need plenty of protein, vitamins C, folic acid, and iron because the baby will start using extra supplies to help him mature. This, in turn, can make mum feel a little run down. Being pregnant is sometimes not all it is cracked up to be. When people talk about it, you assume that it's sickness and heartburn, yes, but otherwise 9 months of happiness. Well it's not. Today I have woken up sad. I feel down and would say that I don't know why but I do, the hormones from my pregnancy have just affected my mood making me feel like this. I've still managed to get things done with the boys, we've baked, painted and made some Christmas cards, but I just have this horrible feeling. Kind of like loneliness but I don't know, weird. The joys of pregnancy eh?! Heartburn is coming on strong now and I have found myself drinking Gaviscon like pop at the moment to keep it at bay. It seems that the fizzy drinks that are keeping me from throwing up, are the exact same thing that are causing me bad heartburn. That's just my luck! For bump, this week he seems to have come on a lot. Fidgeting loads now and constantly kicking me, he seems to love the warm water when I get a bath and the boys love watching my tummy make weird shapes as I lay there watching. 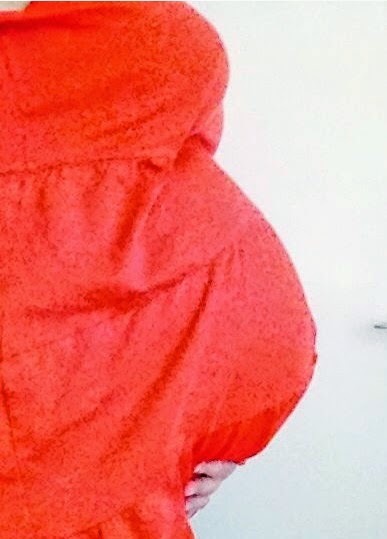 It's lovely to feel him moving and to see my bump growing bigger all the time! At 28 week, the baby is doing lots of blinking because they’re now responding to light and dark. Not only that but they are going through a lot of physical developments. Bone marrow is now a construction site for blood cells, while their adrenal glands are actually producing androgen and estrogen. The latter means that mums (my) body is stimulated into milk production. Can everybody say mooooo! This week I finally got to see the midwife again. If, like me, you have had previous pregnancies, then the midwife doesn't need to see you as much. It's more a case of seeing her for blood tests and only when necessary. I guess, after you have been through it the first time, you know what to expect and so they don't really need to see you. That is unless you are high risk of course. So anyway, my midwife appointment was fairly routine. There was a student midwife in and, to be really honest, they don't half annoy me as they always seem very judgemental. Well, not when I'm around because I make my opinions and decisions known. I explained how I plan on breastfeeding to start with (as I did with my previous pregnancies) and will then mix before settling on formula. This is when the student midwife decided she knew more about me than I did and went off on one about how I should only breastfeed. Let's just say that I may have told her a few things that she needs to learn before speaking to someone who has been pregnant before and knows what she wants. Putting pressure on mums to do what is expected only causes more stress for them. If a mum has made her decision then who are we to judge? Anyway on from that. 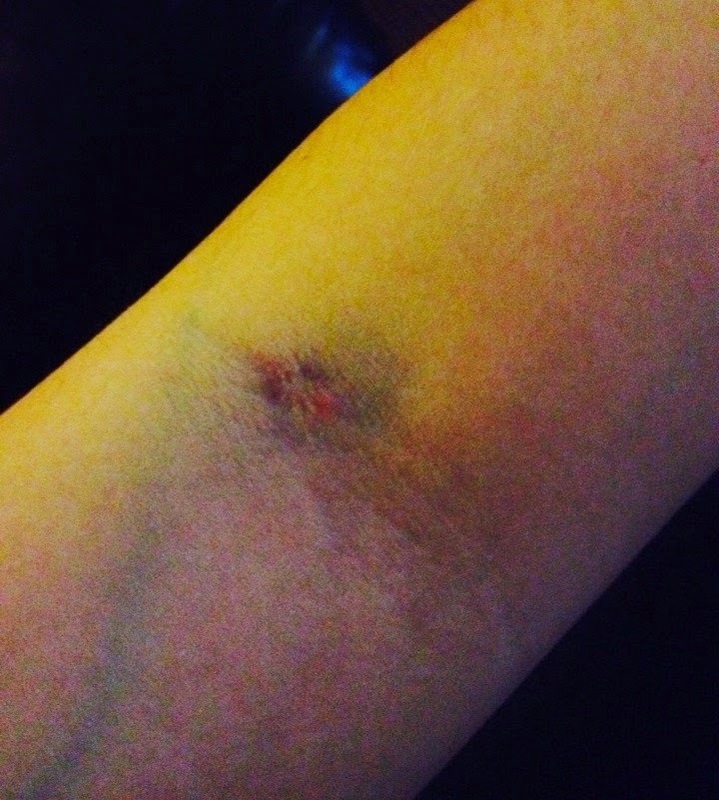 My relationship with the student midwife then went from bad to worse as she did my blood test. Not only did she mess up the first test by taking the tube out too quickly, she then went on to try in my other arm, leaving me bruised. I don't seem to have any luck when it comes to blood tests! On a positive note, I got to hear my little boys heartbeat and, whilst the midwife was checking it, my baby decided to have a little dance. My tummy was bouncing around like nothing I've seen before. It was so cute! They found a trace of protein in my urine which can be nothing but also can get quite serious so this will need to be monitored next time I see her and she gave me advice about symptoms of water and kidney infections which did scare me a little and then had me on edge all weekend thinking that I was going to have a serious condition. Overall, it has been a mixed week. The muscle in my back is playing up (I always seen to pull it when the cold weather sets in) which isn't great, especially when pregnant but on the plus side, I heard bump and he sounds like he's having fun in there. When someone emails me and asks if I would like to try a Yorkshire brand of confectionery, I have mixed emotions, one of, oh yeah, it will be great to support a Yorkshire brand and the other part of me thinks, mmmm sweets, give me them here haha, so obviously, I said yes! Ultimate English are a traditional business producing confectionery from Harrogate in North Yorkshire, not too far from us. They have spent 150 years crafting and refining their confectionery to make it the best it can be, all done by hand. 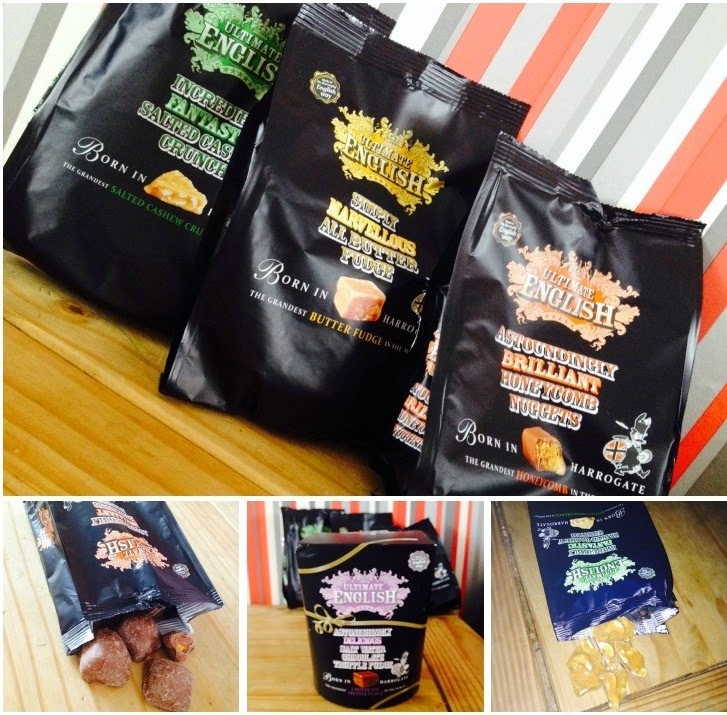 From fudge to honeycomb, there is a lot of choice to pick from and I couldn't wait to see what we received, keeping my fingers crossed for honeycomb and cashew crunch as they sounded like something that I would love and I wasn't disappointed when our parcel turned up. Packed with the finest quality cashews, The toffee is super moreish and the salted taste is the ultimate indulgence and just gives it that kick of extra flavour. This soft and creamy luxury butter fudge is made with an extravagant 16% butter recipe to deliver a rich, smooth texture and has a caramel kick to it. Made with a luxurious coating of Belgian chocolate, this heavenly honeycomb is whisked for extra crunchy lightness, then broken by hand. A yummy, crunchy, moreish treat. By combining the all butter fudge with the highest quality Belgian chocolate, Ultimate English have created a stunning fudge that is so lovely and the salt water flavour just lifts it to even higher pleasures. For me, my favourite was the Salted Cashew Crunch as it was just bursting with flavour. I would have liked to have tired the Honeycomb Nugget but I was too late as my husband and sons enjoyed eating the whole pack between them. I love fudge and like how they have taken a traditionally English sweet and given it a quirky twist to create an awesome new flavour. A flavour that has gone magnificently well, topping off our home-made flapjack. We simply made our flapjack and then 15 minutes before it was due to come out of the oven, cut up some pieces of the Salt Water Chocolate Truffle Fudge and place them around the top. When the flapjack was finished cooking, the fudge had melted into it giving a scrumptious extra flavour which was simply stunning to eat. Overall, I was so pleased with the confectionery and the yummy flavours that they included. The range is only available in local farm shops and delis across Yorkshire at the moment and has recently been awarded a gold star by the folks at Great Taste. For more information, visit the Ultimate English website. To be honest, I am not too sure when the third trimester starts, some people say from 25 weeks right up to 28 weeks but I really don't know. I just assume that it's around the 27 week mark as that's a third of the way into my pregnancy. Entering the third trimester feels like a huge milestone. After losing a baby last year and finally getting this far and knowing that I'm only a third of the way away from meeting my baby is such a relief. At this stage my baby really means business when it comes to growing. He is measuring around 39cm in length and weighing about 2.5 pounds. 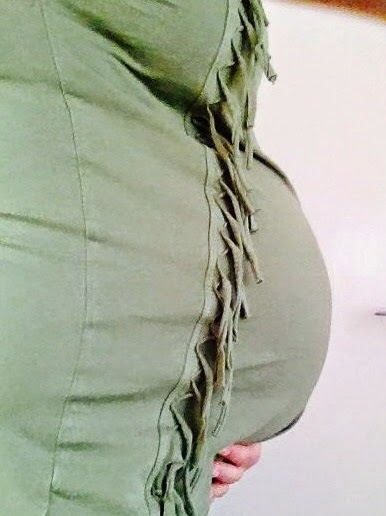 My bump is growing huge now and I find it harder to get a good night’s sleep, constantly tossing and turning to get comfortable. Between that and the constant urge to pee, I'm sure you can imagine how disturbed my sleep is. I find that using my Theraline pillow (you can read my review here) between my legs and under my tummy gives me extra support and can really help, even if it's just to have a relax and rest not actually sleep. Tiredness is very normal at this stage as not only is lugging a huge bump around quite exhausting but, the baby is also using my supplies and causing mum to feel tired. Normally, at this stage, with the birth date drawing closer, I would usually be considering doing my birth plan; where I'd like to have the baby, who will be there, what I do an don't want etc, but to be honest, after having 2 children previously, I am fully aware that labour often does not go to plan and so having a birth plan can just lead to disappointment when it doesn't happen as you wish. For that reason, I'm not doing one, my labour will flow as expected and if anything happens, the midwives will know what to do for the best. This week I see my midwife so that she can take some blood again and go through my preparations for labour so I'll see you next week for the next update. With Charlie still struggling with his talking and undergoing speech therapy, any toy that will help teach about language is a big plus. Especially ones that include games to keep children interested in learning. Mr Tumble's Alphabet is an interactive phonics game which has 8 great games to learn all about letters, alphabet and word recognition whilst having fun with Mr Tumble. There are 26 chunky backlit keys with colourful Something Special illustrations and sounds, which offer a great way to discover new words, sounds and spelling. Packed with fun and challenging activities that captivate and enlighten play time whilst your child discovers colours, numbers, objects and a lot more with the game modes which includes, match, find a picture, answer a riddle etc, all things that will keep young children playing and learning. Not only that but children will love hearing Justin ask them questions and guiding them through the games as he is someone that, no doubt, every child loves and watches on television and so can associate with him whilst playing. With lights and sounds, Mr Tumble from Something Special makes learning the alphabet and phonics easy and fun. 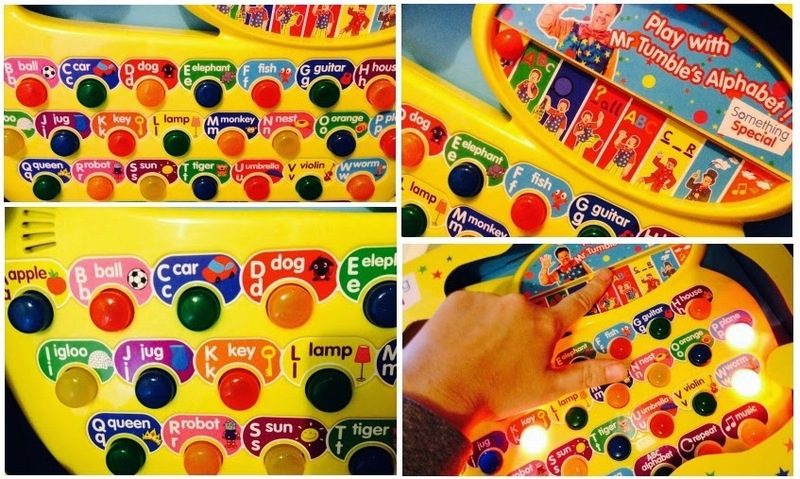 Every time you press a button, it, it lights up and explains the letter, colour, word associated which is great as children copy this and start to learn about how words look and sound. Charlie loves playing with the Mr Tumble's Alphabet toy and joining in with it, saying what Mr Tumble says after he's finished. It's great to see him saying new words and getting a better vocabulary as he's playing. And if that wasn't enough, the Mr Tumble's Alphabet toy has been awarded 2 silver medals from Loved By Parents, for being the best interactive toy for ages 3-6 years and the best electronic toy for 3-6 years also so that shows just how good it is. Overall, this is a fantastic toy that is fun and educational and children will enjoy for time to come. Check out the KD UK website to find out more about their ranges. I am such a big kid at heart. I love anything that is remotely childish an love nothing more than the big dates on the calendar, you know, Halloween and Christmas. They are my favourite times of the year. On Halloween this year, streamers, banners, signs, pumpkins and spooky lights adorn our house, a great spectacular to witness. A caldron full of goodies for trick or treaters and me in a scary mask to finish it off. The boys love it also, we had a bit of a hit and miss day to start off with. Daddy wasn't at home, hasn't been for most of the holidays (boo!) and so I took the boys to a local play centre to run off some steam. It was all fun and games until Charlie decided to have a fight with a chair and lost. Ending up with a deep cut above his lip and a further cut inside his mouth. Not that he was bothered. I was panicking at the blood and he just wanted to go and play. Home time came and the boys finally got into their costumes. Both being scary skeletons. Although Thomas had a mask to wear, I tried out a bit of face paint in him beforehand which he loved. 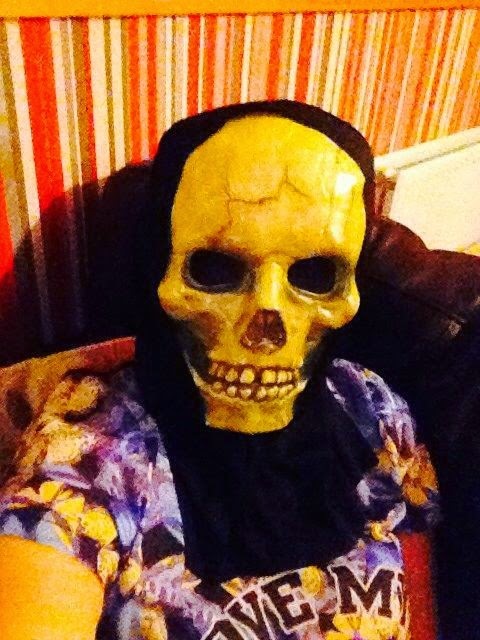 We live on a small estate and had agreed with the boys that we would take them around a few of the houses trick or treating which the enjoyed doing. Knock, knock, knock! Trick or treat?! Getting home, the boys looked through their haul of sweeties and had a couple of them to munch on too. To say we only went to a few houses, they managed to get a good amount of sweets and chocolate! The boys both fell to sleep early after their busy day and I am so happy to see them doing what children do best, having fun!